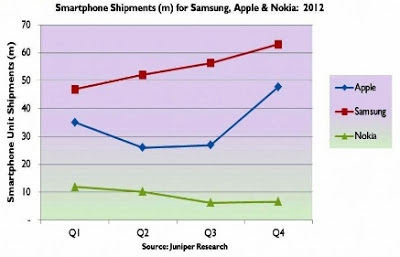 Smartphone shipments exceeded 200 million units in Q4 2012, with the annual total reaching 671 million -- representing a growth of almost 42 percent year-over-year, according to the latest market study by Juniper Research. Samsung continued its phenomenal growth over the year shipping a record 63 million smartphones and accounting for over 30 percent of all smartphone shipments in the quarter. Once again, sales of the Galaxy S3 drove growth, with sales surpassing 40 million in November 2012. However, despite the holiday season boost and iPhone 5 sales, Apple posted lower than expected iPhone sales -- at around 47.8 million, but still a record quarter for the company. With Samsung leading the market, Juniper believes that Apple will need to continue focusing on innovation, while retaining its brand leadership. Meanwhile, Nokia shipped 6.6 million smart devices in the fourth quarter, with the new Lumia device line still to make a significant impact with shipments of 4.4 million. Nokia’s Symbian based handsets experienced a large decline, reaching 2.2 million. Overall, the Finnish company made a $3 billion loss for the year, but posted a profit of $586 million for Q4 2012. Smartphone shipments reached 35 million in 2012 compared to just over 77 million in 2011 -- that's down by 54 percent. BlackBerry's recent results -- which run to a different financial schedule -- are expected to account for almost 6.7 million smartphone shipments for Q4 and over 31 million for the year. With the release and launch of BlackBerry 10 and a new line of smartphones somewhat improving the situation, the Canadian company will struggle to gain back a significant market share in 2013. Huawei posted impressive sales in 2012, with the introduction of a range of new smartphones and tablets, posting sales revenues of over $35 billion. The company introduced over 23 models of smartphone devices and is estimated to have shipped almost 20 million smartphones in 2012. While other smartphone vendors, including LG and ZTE, have managed to maintain their smartphone market shares, they are still facing challenges when competing against the premium brands. Similar to Samsung, these vendors are introducing a number of new product lines and launching marketing activities to maintain their visibility in the global mobile handset market.